You can’t have been a thrift store junkie as long as I have without honing your eye for beauty and solid craftsmanship. The problem with a lust for 1930s crystal cocktail glasses with their fine, imperfectly etched bowls, for example, or the ability to suss out vintage alpaca or 1940s rayon by touch alone, is that I end up toting home too many gorgeous things I’ll never use. That butter-soft tweed Brooks Brothers overcoat? It went to a friend’s husband whose girth supported it. The chocolate brown Manolos two sizes too small? Seven dollars later, an intern in my office was wearing them. Let’s not even get started on geometric mid-century lamps, Murano glass ashtrays, and mouton jackets. I crave these items for their quality and style, but they don’t always fit into my life. That’s how I feel about Parfums MDCI Chypre Palatin. I love everything about it and long for a bottle, but it was made for someone else. However, if Chypre Palatin suits you, you are in for a real treat. 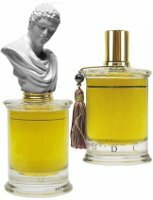 Perfumer Bertrand Duchaufour developed Chypre Palatin, and Parfums MDCI classifies it as a “green oriental chypre.” Chypre Palatin’s notes include hyacinth, clementine, aldehydes, cistus essence, galbanum, thyme, lavender, rose, jasmine, iris concrète, prune, gardenia, benzoin, styrax, leather, vanilla, tolu, castoreum, costus, oakmoss and immortelle. The result is a fragrance with the structure and delicacy of an 18th century French table. I’ve been wearing Chypre Palatin all week, and every day the fragrance reveals something new. At first I was fascinated with its floral-lavender aspects. It smells masculine but not macho. It references the lavender-accented fougère, but leaves off its tart and sometimes obnoxiously bracing side. If you see the "green" and "chypre" part of Chypre Palatin's description and assume it will smell like Chanel Cristalle or Yves Saint Laurent Y, wipe that from your mind right away. Chypre Palatin is much more languid, sweet, and earthy than either of those. Then, I saw Chypre Palatin as a sort of older brother to L’Artisan Parfumeur Séville à l’Aube. The brother, a dandy, is more sophisticated and a tad more reserved, but these fragrances are linked by green, lavender, amber, and a carnal earthiness. Where Séville à l'Aube turns orange blossom sweet, Chypre Palatin breathes a spice that smells to me like cardamom, although it might be a trick of the fragrance. Where Séville à l'Aube paints a fantasy full of putti and groaning vases of flowers, Chypre Palatin reins its vision to the dressing room, valet firmly at hand. Still, Chypre Palatin and Séville à l'Aube complement each other. Day three or so I pondered how Chypre Palatin could be so intricate, yet so robust. The fragrance smells like a complex tapestry weaving clementine and amber and lavender and the clean-dirty scent of costus in an engrossing pattern edged with dry, subtle flowers. It leaves me thinking, Hmm, little did I know how beautiful lavender-grey and pale orange are together, especially when woven into griffins and gerbera daisies. But like a tapestry, despite the intricate pattern, Chypre Palatin’s fabric is remarkably durable. The fragrance lasts all day on me and eventually smooths into a spicy-mossy amber, but it never really changes character. Last, I recognized Chypre Palatin as Duchaufour’s work. A whisper of incense curls around Chypre Palatin’s dry down, imprinting a modern touch on a perfume constructed for another age. Ultimately, Chypre Palatin seduced me with its beauty and craftsmanship, but like a Versailles-era oil painting, it isn’t quite “me.” If my budget didn’t limit me, I’d order a bottle in a second to sniff when I wanted reminding of the skill and imagination of a gifted perfumer. This is the sort of fragrance that rewards the nose you’ve developed through all the years you’ve sniffed through piles of samples. It also rewards a mind open to beauty that melds tradition and modern sensibility. Parfums MDCI Chypre Palatin Eau de Parfum can be found in 60 ml Eau de Parfum for $250. The bust edition is $375. For information on where to buy Chypre Palatin, see Parfums MDCI under Perfume Houses. One word: woow! This fragrance sounds amazing. I didn’t try a single MDCI fragrance in my life so far but it sounds really good. Definitely sampling worthy for me. It really is beautiful, but it’s subtle. Some people might sniff Chypre Palatin and think, Oh, another lavendery-man thing. But really it’s a lot more! It warrants careful appreciation. What a beautiful review! I have never tried the MDCI fragrances as I don’t need to desire more expensive scents, but you’ve convinced me to sample this one. I know! They’re so expensive! The sample set is a really great deal, though, and the samples are gigantic. If the perfume is as well wrought as the gorgeous review it must really be fabulous! Thank you! I just wish it suited me a bit better. If I had money to spend, though, I’d be tempted to buy a bottle anyway. Oh, Angela, you make it sound so tempting. I’m adding this to my “to try” list. I had to laugh when you described how you accumulate vintage stuff. Being an antiques dealer, I come across plenty of gorgeous items of quality and craftsmanship that I don’t actually need or are not suitable. It’s hard not to accumulate stuff, but if I buy something that I really don’t need, I’ll admire it for a while and then sell it on. I know just what you mean! That’s what I do, too. I end up passing a lot of things on as gifts. My friends probably dread my arrival by now. Invite me to a dinner party, and you’re likely to end up with a set of Spode tea cups or a 5-foot chalkware rosary with hand-carved beads. I’d be there in a second! I’ll bring you a set of James Cain novels printed in the 1950s. Was that you, Angela, who bought that 5-foot rosary from me on ebay?! Just kidding. I got mine at Goodwill! It’s hanging in my office right now, and it perplexes me every time I see it. Why the heck did someone make a 5-ft rosary? They are used as wall decorations; for declaring one’s faith. It adds a nice touch in the right setting. I do have to say that it IS a gorgeous object. This sounds positively divine and, despite not needing an expensive lemming, I will have to sample it! Whether it is ‘me’ or not, I have no doubt that I will enjoy the experience. I’m curious, though, who you think the ‘someone else’ it was made for is- any suggestion as to who you envision wearing it? That’s such a good question! For one thing, although Chypre Palatin would smell good on any gender, it does skew masculine to me. But not brutishly masculine. It’s beautifully behaved and romantic, but no-nonsense. Hmm. Maybe it would suit a botanist who always wears cashmere socks. ‘A botanist who wears cashmere socks’ – someone with a very good attention to detail and an ordered scientific mind who is a secret sensualist. Perfect! Yes! And who likes nature. I know what you mean about how this habit can get costly! I should have got in on a split of Chypre Palatin early on. If another comes up, I’ll jump on it. If you ever come over, I have a nice set of candlesticks shaped like flowers that need a home! haha Would love to! I think we’re on opposite coasts though. Boo. A small decant of MDCI’s Enlevement au Serail just arrived in today’s mail. I feel the same way about it that you do about Chypre Palatin. It’s not really *me* but its so gorgeous I need to have it in my life. I adore Enlevement au Serail. It’s so gentle and mossy and just plain pretty–like Femme’s innocent baby. Enjoy the decant! A wonderful review. I hadn’t thought this one would suit me based on notes, but after reading your How It Feels, I’m pretty sure it won’t be me. Thanks for letting me see that world before I close the door without regret. Always glad to be of service! I do recommend sniffing it, though, if you get the chance, merely to appreciate the artistry. I have been interested in trying their sample set. I just looked at the site, and 5 12-ml samples for about $100 is not bad, especially compared to the cost of regular bottles. I am not clear, though, on how exactly one goes about ordering. When I did it a couple of years ago, I sent an email through their site. Also, the cost of the set is deducted if you end up buying a bottle later, and I don’t recall that postage was charged. L’Aube is wonderful! Make sure you get the chance to try it sometime. It’s interesting how BD adapts to different brands, isn’t it? This one aligns with the classical elegance of the brand, and Frapin 1697 exudes the fire and sweetness of cognac, and his subtle command of incense and unusual notes like cypriol lend the depth and character of a Rembrandt portrait. The Duchaufours I love the most are the ones I don’t usually wear, but rather keep on hand for private contemplation. I know I need at least a decant of this one, too! Good point about his adaptability! Chypre Palatin smells pretty classical to me. A decant is a great idea. I just love this House (collective?) It’s where perfumers can go to play around and make the scents they really wished they could make — a respite from their “day” jobs, so to speak, where they’re usually boxed-in by marketing, focus groups, who dictate throughout entire projects. The price point does make people’s eyes roll, in snooty disregard, but their scents are genuinely beautiful and each is a perfect example of the style/genre they’re trying to represent. I tried “Rose di Siwa”, which I think is by Francis Kurkdijan, “Enlevement au Serail”, which I love for it’s baroque, “decaying estate” kind of velvety dustiness (can’t remember who made it) and “Promesse L’Aube” which I totally adored — it’s such a beautiful, liquid sunshine kind of scent that has the richness of Chanel’s “Allure” without the chemical goopiness and aldehyde overload. I’ve seriously considered buying “Promesse L’Aube” but I think they may have stopped making it. A brand that, I think, honors the same kind of antiquian richness is “Parfums de Nicolai” (I heard the main parfumer is a Guerlain great grandaughter or something like that, but I can’t remember the full story). If you’re someone who loves “Enlevement au Serail”, you’d probably also love “Le Temps D’une Fete” by Parfums de Nicolai. It has that same kind of sun-warmed, fur coat kind of baroqueness to it, with some velvety greenery in the background. Their pricing is much more accessible, in the $45 -$115 range, with some exceptions. But it’s really worth testing Parfums MDCI out, even if you bland at the pricing because they make such special scents. They’re richly layered, textured, faceted — however you want to define a multitude of notes in a scent that never manages to jar, that come together in really unique, yet familiar feeling, compositions. The mini-set is definitely worth it. And should you find your perfect fit amongst them, they’re definitely full bottle worthy, even if it’s the only scent you buy all year and you use your full fragrance budget on it :). I really think they’re worth it. Don’t worry about typos! They happen to me, too. I really do love how MDCI seems to let the perfumers make beautiful fragrances regardless of the cost of materials (not that I have any true or insider idea of how MDCI works). The fragrances really do feel like works of art, and it’s one perfume house where I look forward to new releases. Still, with all the perfume I have I really don’t need a bust on my bottle. It’s all about the lovely fragrance for me. The original $600 Limoges flacons had a porcelain bisque bust, and the new range are another white material, not specified on the website. I do wish I had the budget for the bust bottles – as well as the corresponding pre-war penthouse apartment, designer wardrobe and evenings at the opera, etc. I love the packaging of this line but have yet to try one of the frags. Your review makes me so excited to! I consider Versailles my real home, or at least my home from another life, so maybe I’m the one they made these for!!! Haha. In all seriousness, do you know if the line does a white floral? I can’t remember a straight white floral, no (although someone correct me if I’m wrong!). Maybe that will be next on their line up. They need to get on it!! I’ve been studiously ignoring the MDCI line (for now) because of the prices, but I’m not sure how much longer I can keep that up. Every time I read about one of their fragrances and remind myself that it’s waaay out of my price range, I feel like I’m turning my back on true love or something equally maudlin. I guess a sample or two couldn’t hurt … right? Not to mention a decant or three! The sample set is a great way to get to know the line, and the samples are generous. Angela, I see that you and Nozknoz have correctly inferred that I was fishing for enablers. You came to the right place, Emily! I’d also recommend Duchaufour’s other MDCI, Belle Helene. It’s the wonderful leather fruit idea of Traversee du Bosphore with pear instead of apple loukhoum – very elegant and beautiful. What I like about this line is that it seems to have a lot of integrity. I don’t get the feel of focus groups, cheap materials, and market baiting. Instead, the perfumers seem to make fragrances that please them. I wonder who started the generously sized exploration sets. The BKs are also a healthy 5 mls, and the Xerjoff sets are more than five mls. I’m thrilled that Neela Vermeire and Annie Gerard adopted the idea, too. And a honorable mention to Puredistance for their beautifully packaged sample set. The samples aren’t large, but their perfumes are so concentrated that one can get a valid test (and a lot of enjoyment) from the set. I guess it must go back to the old idea of coffrets: I’ve got two beautiful vintage coffrets from Lanvin and Jean Patou that are wonderful. I’m so grateful that some houses have revived the idea! I agree! Really, you have to live with a perfume for a little while to know if you want to invest in a bottle, and generous samples are the way to do it. Well put. It IS a stunningly beautiful fragrance. On me, I prefer it to the Aedes de Venustas EDP which came out about the same time and is also BD’s work I believe. I consider Chypre Palatine to be better balanced. I was lucky enough to be given a goodly sample and wore it one day when I was doing my reading mentoring thing at a local school. As I got up to leave, the session having ended, one of the pupils grabbed my wrist and said “Miss, Miss! You smell wonderful!”. I was SO impressed. It seems that you are always overcoming your reviews Angela. Wow, this one of your best dear! I liked how you did a 360 degree review of this fragrance, looking to through its evolution from all angles possible and combining this with a poetic description. Very good dear, you made me curious to try my decant of it now…. If you have a decant of it, you definitely should try it! Give it some time to show you its layers…. Lots of people cringe at the MDCI price point, but the refill bottles are really not all that bad. If you purchase a sample set directly from MDCI, you get five 12ml “samples” of your choice for 90 Euros shipped. That’s $116 US for 60ml. And you can apply your purchase of the sample set toward the purchase of a full bottle. And the fragrances are GORGEOUS in my opinion!!! Love this line. I’m always interested to see what they release. I wonder what’s up next for them? I got a sample of Chypre Palatin from Luckyscent right after I read about its release here. I really love it, and I want to get a decant. It’s expensive, but it has a richness to it that suggests that no expense was spared on the materials. It isn’t something I would wear all the time simply because there does seem to be an air of formality about it, but it’s really gorgeous. It’s the first MDCI fragrance I’ve tried. I want to try more of them. And I haven’t had a chance to try Seville a L’Aube yet, but after reading the comparison here I really really want to even more now. I hope you get to try more from the line soon! Seville a l’Aube doesn’t smell the same as Chypre Palatin, and some people might think I’m crazy, but I swear there’s something that relates them. I tried this one when I was in Paris in June. Loved it. The one that took my breath away though was Promesse de l’Aube. It very nearly brought tears to my eyes. I hope you brought home a bottle! Anything that brings (good) tears to your eyes is worth having around. No, I didn’t. I had already bought La Myrrhe and Fils de Dieu. But it has been lingering in the back of my mind. I hope I will find the funds to buy a bottle before it gets transformed into something else.